• Comes with Crossbow and Knife • Features Daryl Dixon's new bike with amazing attention to detail based off the bike Daryl uses in Season 5 and 6 of AMC's The Walking Dead. 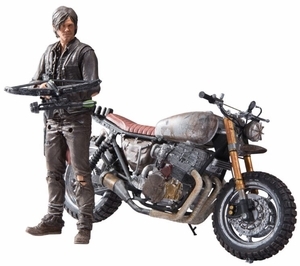 • Spectacular likeness of Daryl Dixon taken from 3D scans of actor Norman Reedus. • Sculpted in the outfit worn in Season 5 of AMC's The Walking Dead.